After three days, I thought your comments would have resulted in a response from someone apart from me! As for the minimal participation, I often wonder whether this is as a result of the content of some Posts or whether it is something else. You know my feelings about the amount of chit-chat in the past, but I have mellowed, and now find it refreshing! One thing I have noticed, is each time I open the website, it invariably shows no member online - a marked difference to the old dtcawebsite.org days when one would find at least one or two other members online. I hope I see more comments from you on some of those other recent posts - not forgetting any that go back in history! Now that the summer is here, most websites are going to have reduced traffic as people make the most of the weather. Plus there are always more lurkers than posters. I've added a stats panel below New Comments in the side menu. This morning arrived the Peugeot 204 below. At the NAMAC Toyfair in Houten last week I could buy this rare color Aveling Barford Diesel Roller. Far from mint, but when will you find another? I have only seen a handfull of these on pictures. This is the first one I can hold in my hands. Needless to say I enjoyed Houten very much! Hi Rob, thank you for having had the privilege to behold it with my own eyes in Houten. Just back home, we had a delightful DTCA weekend in Derby. The get together with the fellow DTCA guys was another happy event. Demonstrations, buying and selling, the beers, dinners, the after dinner speech and the AGM itself were all in a very positive, comradely atmosphere. The limited number of my catalogue supplements sold like hot cakes. I took no photos, they will be published some time, no doubt. Very nice addition Jan, and it will pair nicely with your light blue one. With the AGM and visits with other fellow collectors, was there any mention of Jacques? I and certainly others must be concerned about the lack of any new updates, and I am quite surprised that his daughter, knowing his lifelong Dinky involvement, has chosen not to communicate further. I had an opportunity to purchase a very nice green version of the #110 Aston Martin Racing Car, in the competition livery, and it just arrived yesterday. Here are a couple of pictures....I will post a more extensive review of this nice model later. I think we all love ebay don't we? 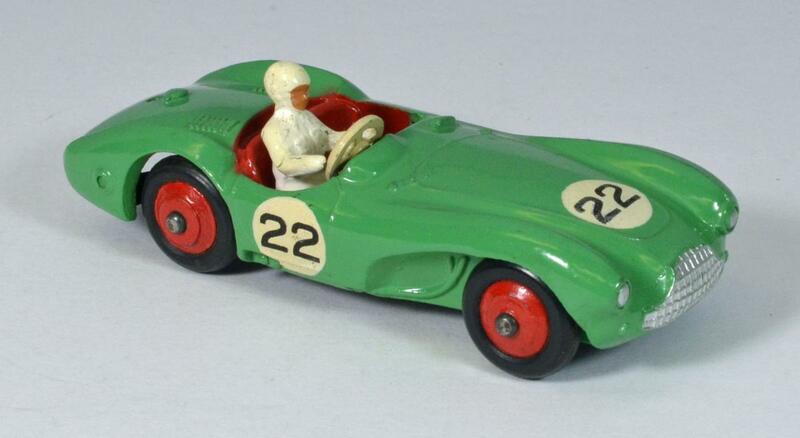 Here is a lagonda in early post war trade box swagged for £28. Grey body with grey hubs, dark grey interior and silver edged celluloid windscreen. Not known to Richardson but mentioned in Ramsay with a zero on the end of the price. Where do they get these from? Then a perfect unboxed Castrol tanker courtesy of the local toy shop. I read on the lagonda thread that you and Jacques were saying lagondas with thin screens and coloured hubs were later export products. I can't find anything in the usual references to back up those statements. What sources were you looking at? The box came with the car but I cannot say if they were always together. 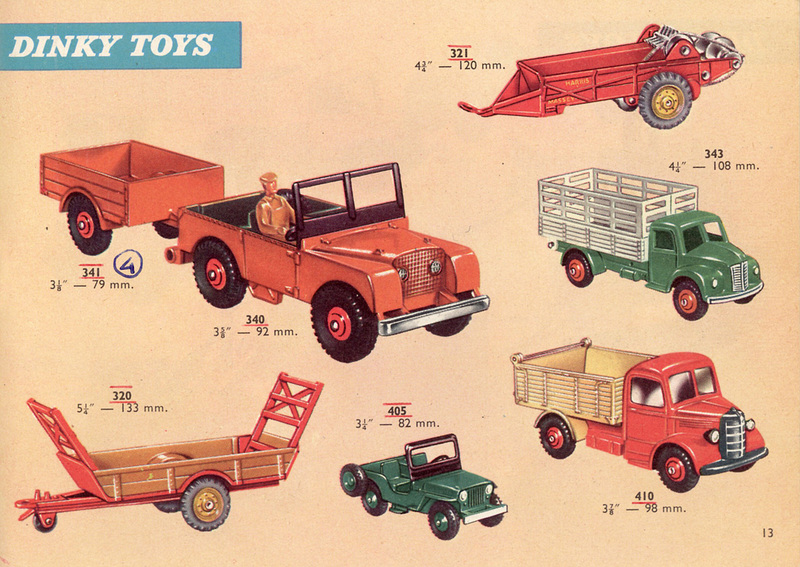 The Meccano Magazine promised that some Dinky Toys would be available for Christmas 1945. Judging by the back cover notice, supply struggled throughout most of 1946 even in the months after the new models, of which 38c was the first, were announced. Thin screens seem to be more common however. How do we know that the thicker plastic screens were not a short-lived late alteration? All the 38 models had the slot for the windscreen altered in 1945. We know this from the original drawings. For the Lagonda we have 2 change orders c.o. for the slot. First length of slot was original .937 and was altered to .900 on the drawing as change order 1640 d.d. 20-12-45. Width of slot was .025 and was altered to .035 on the drawing as change order 1862 d.d. 30-12-46. This alteration to wider slot is also done on the drawing for Alvis and Sunbeam. So I presume all models with thick windscreen must have been produced from 1946 on. Hello John, thanks for this basic design information. Do you have pre-war or very early post-war 38 series models in your collection that show the (original) pre-war thin windscreens? Or do others? 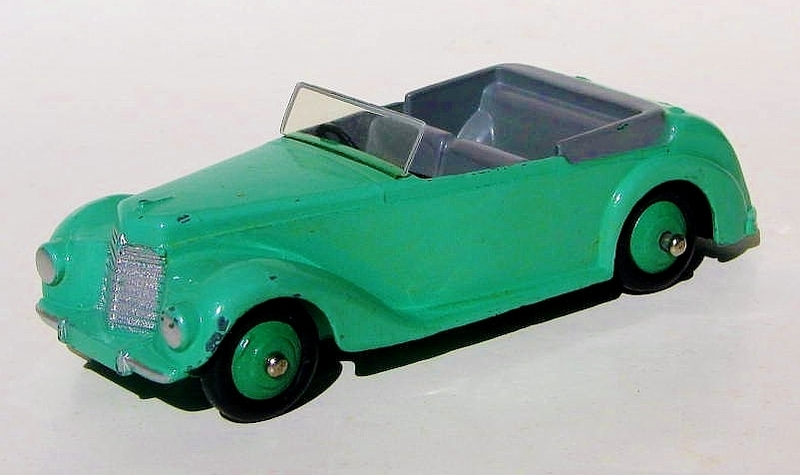 Possibly there was a mix of thin and thick windscreens from 1946 on, as definite later models do also show the (often bent down) thin (celluloid?) screens. This is getting a little off-topic, but I don't know where to continue without loss of context. I must add that here in the US, I have never seen myself the thicker, silver ridged windscreens. As Jan has already noted, all my examples of the 38 series are the later, export versions, all with colored wheels And the thin plastic windscreens. 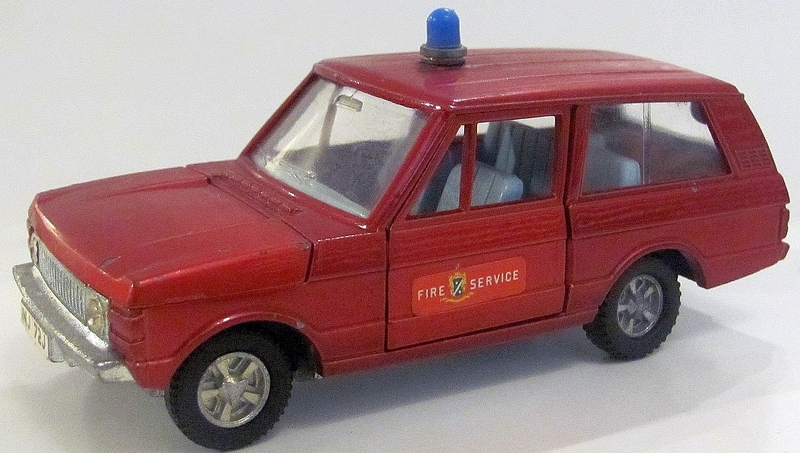 And it would seem a bit strange if Dinky had produced both versions, given the complexity that would have created. Without proper drawings, this may remain one of those Dinky mysteries! I am not certain where the jury is on the thickness and style of the windscreen as I have never seen any of the drawings to which John refers, but my 38e Armstrong-Siddley has the thicker windscreen with silver edging, so I am uncertain where this comes in, but I quite agree with you that Meccano would not have been producing different windscreens for different markets. I am certain the aperture in the base plate would have been designed to cater for any thickness Meccano's suppliers came up with no matter when the thickness of the Perspex changed due to supply uncertainties. I received mine in 1950 - and I do not think the fact that Australia being a member of the British Commonwealth (Empire in those days!) had anything to do with it!!! The model must have been one of the first issues after the hubs changed to a different colour other than black and just happened to have been fitted with the thicker, silver-edged windscreens. I have been keeping the mailman busy these days with the arrival of a number of new acquisitions from France. Firstly, we have a 666 Missile ERECTING Vehicle with Corporal Missile and Launching Platform. This model arrived in a far better condition than I was expecting. As can be seen by the above photograph, the model and box are in virtually mint condition. The box has no damage to any of the corners which usually suffers from knocks and bangs but it does have an unusual end spot in red! One of the original rubber bands that firmly secure the Missile to the vehicle, placed there by the factory is still intact and untouched although the rubber appears to have become hardened. So there goes any plans of firing the missile!!! There were also several other surprises, but I will deal with these in the 666 Topic. Another arrival in the same parcel was a further addition to my Volkswagen Karmann Ghia stable – this one from the French factory and a companion to my first example bought a number of years ago. There is an interesting story to go with this model so watch out for it appearing later in the Forum! Then there was this 965 Euclid Rear Dump Truck, one of my favourite models as those who have read the Topic on the 965 Euclid will have realised! This is another one of those with that intriguing green colour spot on the box’s end paper. This acquisition, my 14th Euclid/Terex (“did I read that correctly”, I can hear readers saying to themselves?! Yes – you are correct, my fourteenth!) This example with its box has enabled me to add to the story of the Euclid, and this will eventually appear in the 965 topic. The last one to be opened is a 481 Bedford 10-cwt Van “Ovaltine”. Nothing spectacular, but just a companion for my original model that displays much “loving” youthful wear and tear. The Bedford was yet another favourite model for me in the 1950s so it is nice seeing an example in its original, unmarked condition – as mine once was! Actually, the black and white image below shows my original Bedford “Ovaltine” van taken in 1960. I see an Austin Champ in the Used Car yard – Dave B must have traded in his! But what about that Mercedes Benz Racing Car? Who could have taken that one out on the open road, not to mention where is the missus going to sit! So, quite a mixed bag, none of which are pre-war (sorry about that!) nor are any immediate post war, but none the less, are a welcome addition! Bruce---I would say you have kept the mailman quite busy, and what a "haul" you received! And such a mixed lot....all part of the fun of collecting. And you did get some very nice pieces, and all appear to be in wonderful condition. I have been looking on and off for a Euclid, as I do not have even one version, but I keep seeing some with slight chipping, which really shows with that color.....so I am envious that you have squired away yet another. Those are nice additions, Bruce! I guess the package that was delivered with me today must have been much smaller than yours. I was still looking out for an orange no. 341 Land Rover Trailer, exactly matching my early 1960s orange Land Rover. Now I found one, with the same hubs, black block treaded tyres and the later deep orange. Most of them have plastic hubs, but this one is a perfect match. Jan--A most nice late Land Rover and matching trailer in the late color version. Here is my similar, but slightly earlier one with the grey radial tread tires. Do you happen to know the year that change likely took place? By the way, have a look at the odd, never practiced colour finish of the Dodge Farm Produce Wagon on page 13 of the 1962 catalogue! Thank you for your very kind words. I did have delight in unwrapping each and every one of these models and finding something new or different with them being an added bonus. As you have probably noticed, the latest Euclid did have a couple of marks on it that can be seen if the picture is enlarged but it was slightly better than the boxed model it will replace. I read that you are still in the hunt for a near perfect Euclid, and as you correctly stated, these are quite difficult to find in excellent to mint condition. However, I was not entirely truthful with my statement earlier when I wrote, “This acquisition, (is) my 14th Euclid/Terex”. That statement was true with my actual collection, but my total holding is in fact twenty-four! The remaining 10 went through an elimination process and in some cases, the reason these did not meet the cut was most likely the box, rather than the model. I never swap boxes, as I believe the box in which the model was packaged should remain as one. Of course I am not privy to any “swaps” that may have taken place, but with the Euclids, I have a number of processes that weed out those that fail with either a wrong box or condition of the model and in the process, occasionally it was almost impossible to decide which to keep and which must go that is true to most of the remaining 10 models. What more can I say, but thank you for your kind words. Congratulations on finally achieving your goal in locating a 341 Trailer that matches exactly your Land Rover. I am not certain about this book apart from the fact it is on eBay at present for a whopping ₤184.48 from a seller in Shoeburyness, Essex, UK. I bought mine from AbeBooks in Nottingham (the city where it was published in 2001) at 55.00 GBP. Jan & Bruce---I have that same book as Jan, and I will make some scans tomorrow & post them. I was also able to find my copy in England and think it was about $90 or so. Very happy to have found one so quickly! The more common and the cheaper the model, the easier, the more feasible it is to collect many variants. Thus, my tenth Large Trailer, no. 551/951/428 arrived yesterday. Two of them being the same this brings my number of variants to nine. This one, regular light grey with red grooved hubs, black painted rear wings, 'unstrengthened' rear wing connection, large radial treaded black tyres, outward fixed drawing bar ends, large black towing hook and 'T' transfer at the rear is likely to date from early 1953. The ones still to be looked out for: the early yellow one, the early grey one with black hubs, and the later grey examples with cream and blue hubs, preferably in excellent to (near) perfect condition.